I find myself thinking “I wonder what VARIETY of tomatoes those are”…. 🙂 I’m in a similar situation – we have eaten tomatoes in so many different ways over the last few weeks that we need some more ideas! They are cor de bou (French: coeur de boeuf, Italian: cuore di bue, English: oxheart??). They’re quite ubiquitous along the Med, I think. Looks great! I’m partial to a slow cooked tomato as the resulting umami is delicious. Will check out my polish shop for the sausages. As the quality is usually very good with a high meat content and none or little cheap “fillers”. My local Polish supermarket is one of those Mleczkos! There’s a butcher counter and I found the fresh homemade sausages there. Like you said, no fillers and all meat. I think they are called beef tomatoes?? They are beefy, anyway! Looks so good, great idea for a “warm tomato salad”. 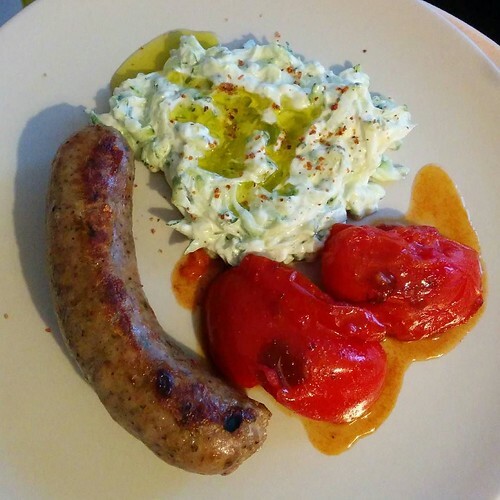 also, the cream cheesy thing looks interesting – is it tzatziki? They are indeed beef heart tomatoes! The creamy thing is yogurt mixed with sautéed grated courgettes and a little garlic! I got the recipe from a friend and it too is another good recipe for another prolific vegetable! I grill toms and eat them on good buttered toast with salt, pepper and chopped basil. Sometimes I put a smear of marmite on the toast. I like the sound of the extra umami from the marmite! Sprinkle ’em with grated cheese, add a dash of Worcestershire sauce & stick them under the grill for a few minutes. Or, maybe, make some chutney. I’ve started freezing my cherry tomatoes! Hopefully they’ll make a nice fresh sauce come winter. Also good with Daddie’s sauce on buttered granary toast, toms on top!